For the last month I’ve been mining Burstcoin because some how over the last 6-7 years I’ve acquired 20TBs of random 1TB or larger hard drives and enough extra server components to be able to plug 14 mismatched hard drives into one machine. In turn I read a lot about Burstcoin and how to optimize the mining rigs. Which in turn one link leads to another and I started reading about the next major stage for Burstcoin, The Dymaxion. The community seems to be really excited for Dymaxion but to do the move to Dymaxion they needed more full nodes on the internet and more importantly they need more full nodes running 1.3.6cg wallet. So I decided to spin up virtual machine to be a Burstcoin node. 20 GBs of space for the database + OS and room for growth. Port forward tcp and udp 8123 on your firewall/router to the machine. At first, I tried to run a full node on Server 2012 R2 because the deployment process wasn’t that different from just running a local wallet, but I ran into issues with the current version of MySQL and importing the bootstrap file, so I scrapped windows and redeployed it using Ubuntu 16.04.3 LTS Linux. My only complaint about Burstcoin is that because Burstcoin is growing so fast some of the documentation is lacking. But if that is the only growing pain then that is a pretty easy problem to overcome. Once you have the virtual machine deployed and the firewall forwarded correctly all you have to do follow this Guide to do the software. I used Ubuntu 16.04.3 LTS and did the advanced installation to integrate the update update process into apt. Start to finish here is the process since it’s a mash up of options 1 and 3. This step process assumes you have already updated the virtual machine to the current patch level. Add “deb https://package.cryptoguru.org/ubuntu/xenial xenial main” without the quotation marks to the bottom of the file and save it. The installation with download and install any missing dependencies. 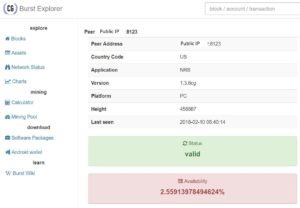 After the installation is complete and the node has been synchronizing for a few hours the Burstcoin explorers on the internet will pick up that you have created a node and you can monitor the syncing process from there. I personally like the explorer on Cryptoguru the best. To find our node under the assumption that your running a node from your house and have a DHCP public IP Address just go to whatsmyip and it will show you your public IP Address. If you have a static IP addresses or working with a VPS provider, then you’ll have consult your documentation from your provider. Just for clarification you don’t need a static public IP Address. In the event your public IP Address changes the network will need a couple of hours to pick up the new public IP Address. 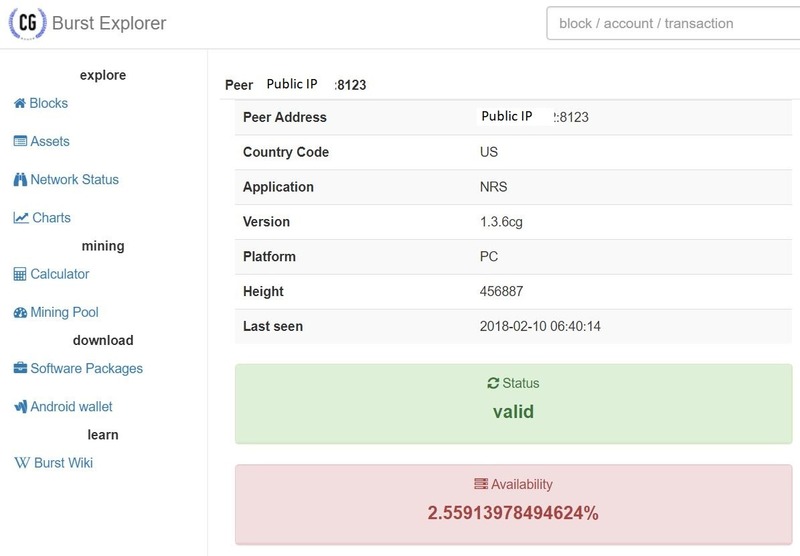 Once you have your public IP Address just go to Cryptoguru and click on network status and use the search box to search your Public IP Address. That’s it the database will grow to 15-20GBs in size so make sure you have that much space available. In the future when there is update to the wallet software all you have to do is run sudo apt-get update and sudo apt-get upgrade. And that’s it. Hopefully you guys spin a Burstcoin node and help the community.